Gary H. Lucas, Director of Innovation at Innovative Treatment Products, wrote an article that ran in the July 2018 issue of Control Design magazine titled Wastewater Treatment Plants Can Be Built for Small-Scale Applications. Any facility too isolated to connect to a larger sewer system—such as a school, office or retailer—will have to supply its own wastewater treatment plant (WWTP), which is where ITP comes in. Learn how they use AutomationDirect parts to keep waste management under control. Innovative Treatment Products (ITP, www.innovatreat.com) in Owing Mills, Maryland, is an original equipment manufacturer (OEM) of wastewater-treatment equipment. It designs and manufactures complete, self-contained, packaged WWTPs for capacities ranging from 5,000 to 50,000 gallons per day. By starting with a clean slate and avoiding the pitfalls of simply making smaller versions of large plants, new pre-packaged plants using membrane bio-reactor (MBR) technology can operate continuously at 5% of rated capacity, while still delivering high discharge quality in compliance with the highest state and municipal regulations. An MBR breaks down biological waste using naturally-occurring bacteria. The wastewater being processed must move from stage to stage at the appropriate rates to allow the bacteria sufficient time to do its work. Additives must be dosed into the wastewater in the right amounts for optimal processing to use the available time efficiently based on the throughput demand at any given flow rate. As a result, the automation system controlling the installation must be able to perform sophisticated analysis of the operating parameters and make adjustments to match demand. Achieving this internal scalability is far more complex than designing a unit running at a constant flow rate. Whether it’s the largest or smallest MBR-equipped plant, the equipment and control strategy are very similar. Measuring progress of the process and the condition of the bacteria requires monitoring pH, oxidation-reduction potential (ORP) and dissolved oxygen (DO). Flowmeters and level instruments are also needed. All these elements are tied together by a programmable logic controller (PLC) automating the entire operation, and by human-machine interfaces (HMIs) for monitoring and operator interface. Whether it’s the largest or smallest MBR-equipped plant, the equipment and control strategy are very similar. A typical unit uses 14 automated valves, four pumps and three blowers. 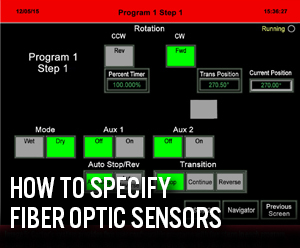 This PLC has a lot to do, so the application requires a versatile and sophisticated unit. ITP has been using AutomationDirect Do-more PLCs for some time, but it recently began using the new AutomationDirect BRX Series PLCs, a stackable micro brick design. When it was time to design the control system for ITP’s first small MBR WWTPs, the decision was to start with a clean slate and choose the best automation supplier, not just the most recognizable name. With a plan to sell these treatment units nationwide, support would have to be available anywhere. And, since most units would be purchased by schools, parks, convenience stores and other small companies, low prices were very important. To meet these requirements, ITP chose AutomationDirect. AutomationDirect’s Do-more PLC was chosen for this application primarily for financial reasons, but it gets the job done well and is easy to support. Also, previous experience using AutomationDirect C-more HMIs and other components over six years made us very comfortable with the company’s capabilities and the product reliability. Capable and reliable components provided opportunities to cut costs on flowmeters by using turbine designs and feeding the pulse-count output directly to a high-speed input on the PLC. The PLC programming strategy takes advantage of the Do-more architecture by using a main program with subprograms for each feature of the system. Using just one control program with descriptive tag names and clear comments ensures everyone will still understand how the program works years from now. The HMI plays a significant role, but it is changing. Displays on the actual unit are now smaller than in years past, with ITP settling on AutomationDirect 6- and 7-inch C-more EA9 series touch panels. By designing the graphics for a small display, everything is also easily readable remotely on a smartphone. Every system has a built-in cellular modem, which gives technicians remote access from the first day, dramatically reducing startup costs. Lucas sums up how well ITP and AutomationDirect work together. ITP’s process design and advanced control system produces high discharge quality while operating as low as 5% of capacity. AutomationDirect control hardware is a very large part of the success. While there are sometimes pressures to use the industry’s market leader for the automation system—the added cost of equipment, software and support would make it impossible for many customers to afford our systems, so ITP plans to stick with what works for the company and its customers. For more articles related to waste management, click here. Out of the Box – Contest Winners!